Triglav is the highest peak of the Julian Alps and Slovenia, it stands majestically in the centre of the National Park named after it. ‘He’ is the true ruler of near and far surroundings. 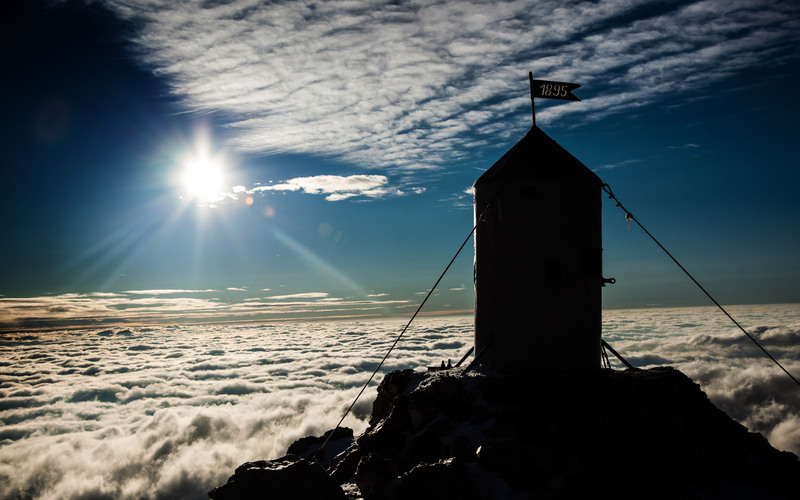 A silhouette of Slovenian sacred mountain and nation’s highest peak proudly stands on the national flag as a national coat of arms. Triglav not only has an appeal on its people, it truly is an international giant as people from all over the world pilgrimage to its kingdom. The first president of Slovenia, Milan Kučan, said it is a duty of every Slovene to climb Triglav at least once in their lifetime. Triglav means three heads (tri glave). Although the mountain is compact, from south it shows 3 heads. On the left is Rjavec (2568m), in the middle is main summit, Triglav (2864m) and on the right is Mali Triglav (2725m, small Triglav). The 2864-metre-high limestone mountain Triglav has been a source of inspiration, devotion, countless stories and legends for Slovenes for more than a millennium. The early Slavs may have believed the mountain was the home of a three-headed deity who ruled the sky, the earth and the underworld, but no one managed (or dared) to reach the summit until just two centuries ago. Thanks to the initiative of Ziga Zois (1747-1819) Triglav was first climbed on August 26th 1778. The four brave men that climbed it were Luka Korošec, Matija Kos, Štefan Rožič and Lovrenc Willomitzer. They climbed from Bohinj lake, over Velo Polje (today Vodnikov Dom hut) to Ledine (today Planika hut) and further to Mali Triglav. Behind it the notorious ridge awaited them. They had to literally ride it because it was so narrow and had a few hundred meters drop on both sides. Triglav was one of the first important alpine peaks climbed at the time. This program is suitable for the ones that want to explore the heart of the Triglav National Park as well as reach the summit of Mt.Triglav. It is great also for families and groups.